Jawdat veut juste trouver l’amour et aller à l’université. Mais dans un village palestinien-israélien, où les valeurs traditionnelles dominent, ses chances de voir ses deux voeux se concrétiser sont minces. Jawdat just wants to find love, and go to the university. But in a Palestinian-Israeli village, where traditional values dominate, his chances of doing so looks increasingly slim. This endearing and sharply humorous film about Palestinian youth culture introduces viewers to a generation of twenty something slackers who find themselves caught between angry parents and suspicious Israelis, when all they really want to do is have fun and hang out. Jawdat is a restless young man who lives in a Palestinian village in Israel. All he wants to do is go out with his friends, talk on his cellphone and find love. But these simple goals represent a near impossible task in a place dominated by politics and traditional values. Then there is his father’s ongoing battle against an Israeli cellphone tower that he believes is poisoning them with radiation. From Palestinian director Sameh Zoabi, this is a gentle comedy whose focus on laughter, rather than the politics of the region, is in itself a form of protest. 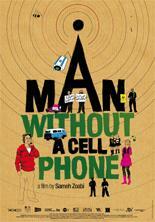 With strong writing, engaging performances and fluid direction, MAN WITHOUT A CELLPHONE is highly entertaining and revolutionary in its own right.